From the moment you arrive at Sydney Airport, you’ll feel the busy hustle of this incredible city. The airport itself has lots of great amenities which you can take advantage of, for example, currency exchange so you can get your local banknotes ready, tax & duty free shopping so you can save some money and treat yourself (although most people tend to do the duty free shopping on their departure, rather than arrival). Sydney Airport also has a great selection of restaurants and cafés, so if you’re hungry or thirsty after your flight, you can fill up on some delicious food before heading out into the city and starting your holiday. When it is time for you to leave the airport, your best bet is to get an airport transfer bus hire. You can hire a bus to transfer you and your group from Sydney Airport straight to your hotel, ensuring you get to where you need to be, safely and stress-free. The Sydney Opera House actually lets you experience two great sights in one trip, as it’s located along the famous Sydney Harbour. The Sydney Opera House stands grand with its unique feat of architectural design and engineering. 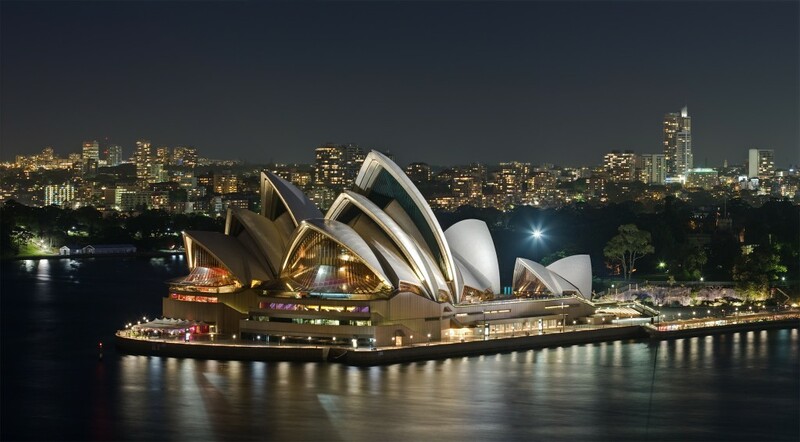 The Sydney Opera House is one of Australia’s most famous landmarks, with thousands of tourists visiting every year. It’s an incredible sight and not to be missed. If you enjoy nature and beautiful scenery, then this one is for you. Take a walk through the Botanic Gardens and gaze in the natural cavalcade of floral beauty. Strolling through the gardens brings a very calm and quiet feel; you’ll forget you’re in one of the world’s busiest cities. You’ll be surprised at just how much wildlife you can spot here too, with flying foxes and cockatoos among the most popular sights. Beautiful panoramic scenes and immaculate greenery, this is one place you will never forget. These caves contain a mixture of 11 incredible show caves, spectacular rock formations and pure underground rivers. If you like history, then you’ll love this one. The ancient cave system is located a couple of hours drive from the heart of Sydney, but it’s well worth making the trip. You can get tours inside the cave to learn more about its history and incredible features. So, how do you find all of these sights and more? Well, finding your way around any new area can be difficult. You can likely book a taxi to take you to your destination, but that’s where the journey stops and you have to decide where to go next and repeat the process. But companies such as Sydney Transport Group provide tours of the city! They can accommodate families, small groups and large groups, taking you on a complete and customised tour of the city, making sure you get to see all of the spots listed above, plus many more. Taking a tour of the city with a company like this has other great perks too - they are locals, they know all of the hot spots in the city, you can ask them to recommend a restaurant that serves your favourite type of cuisine and they’ll be able to take you to the very best! Sydney Transport Group also provides airport transfer bus hire too. To make your holiday really stress free, you can arrange to have them pick you up at the airport, take you to your hotel and then book a tour of the city too! When it comes to transport in Sydney, we have got you covered!